Humminbird 581i DI has an average rating of 2.8 out of 5 based on 5 user reviews. 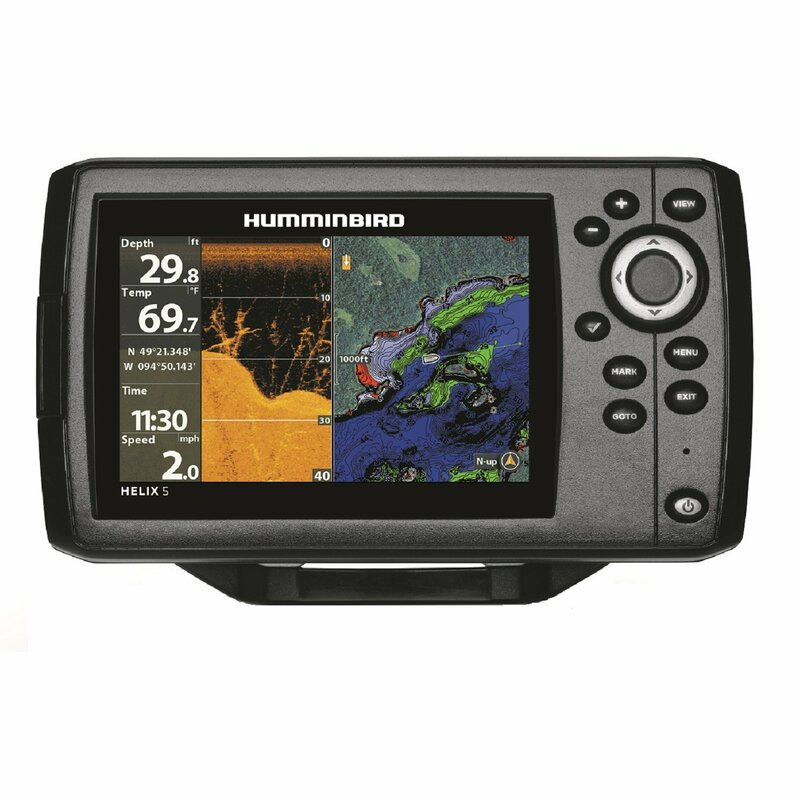 The Humminbird 581i DI is a Fishfinder and GPS in one affordable unit that includes Dual Beam Real Time sonar, Humminbirds incredible Down Imaging technology and full 50 channel track and chart plotting GPS. The ultra bright and easy to read high resolution 16 level gray scale black and white 640×320 5 inch screen makes all images easily readable even in bright sunlight. The GPS system incorporates standard chart plotting and route memory as well as track plotting which records, for example a specific successful trolling path that you can follow repeatedly in order to achieve the same results. The overall GPS system is also useful for saving waypoints as well as the path to that waypoint. The Humminbird 581i DI is a great buy for an affordable feature packed Fishfinder/GPS combination unit. With 2000 watts peak to peak power, 2,500 waypoints, 50 routes, and 50 tracks with 20,000 points each the unit has more than enough memory for most users. The 50 channel GPS with Navionics Compatible cartography also includes GPS speed as well as the Humminbird UniMap. All of this is mounted on an quick connect/disconnect mounting system making the Humminbird 581i DI a solid budget minded consumer best buy. You can get a great deal on Humminbird 581i DI here. I chose HB 581i DI because it was cheapest fishfinder/GPS combo with a 5 inch display and down imaging. I’m very happy with it. It even allows you to mark and save spots on the map. I wish it came preloaded with Navionics maps but it’s a good deal anyway. First off all, this fishfinder isn’t waterproof, the screen got fogged up after couple weeks. Secondly, it’s difficult to use, too many options, too confusing. Thirdly, the screen is not very clear, the fish markings are blending with the grey background, I guess that’s the downside to all greyscale displays. This fishfinder does have a few nice features. The install was simple, navigation in 3D is great, very easy to mark waypoints. Overall, however, not a great unit. I wasn’t able to get this sonar to work properly. I’m not new to fishfinders, I own three other HB units, this one just doesn’t work. I checked all possible settings. Humminbird phone support is not very helpful either. On top of that the GPS is useless unless you buy a separate map card. This humminbird unit does not mark fish ….been thru all possible settings…it’s useless!!!!!!! This is a great mid-range unit for the money. I had seen several bad reviews online form buyers who felt it did not live up to their expectations. In the course of my sporting life I have used fish finders from all price ranges and manufacturers. Trust me when I say that this one delivers on every promise. It has every GPS and sonar feature you could want and is easy as pie to install with the included guide. I have put it through its paces on big and small bodies of water and it has never let me down. The only thing that could be improved are the charts but you can purchase better charts from one of their partners like Navionics. I really like the split screen display for keeping the info I need close at hand. FishFinders.info is a participant in the Amazon Services LLC Associates Program, an affiliate advertising program designed to provide a means for sites to earn advertising fees by advertising and linking to amazon.com. Copyright © 2019 FishFinders.info. All Rights Reserved.